GeoFlux magically transforms from what looks like a series of rings into a wondrous 3-D sculpture that resembles a giant atom or an extra planetary orchid! 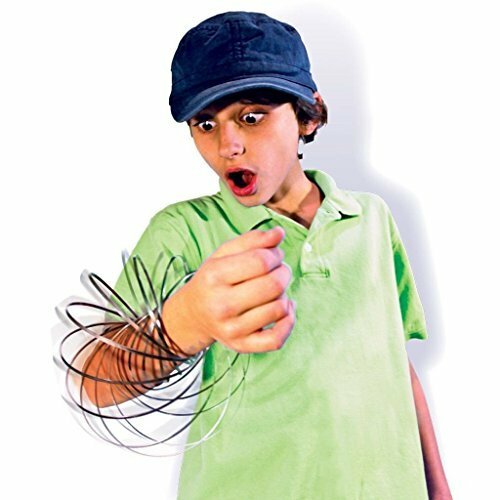 What’s more, when you insert your hand through the coils GeoFlux begins to spiral up and down your arms, spinning so fast it’s a blur of motion. GeoFlux can then “bridge” over to your other arm, staying in perpetual motion. A fantastic party trick and exercise tool, it “fluxes” easily from person to person. Or place GeoFlux on a broom handle, lower one end slightly, and watch as it moves along the shaft, twirling so rapidly it looks like a giant soap bubble. Constructed of one continuous band of rugged stainless steel, GeoFlux folds flat for easy storage in the included travel pouch.